Light unfolds and Activates with a touch of the switch. Batteries Included. 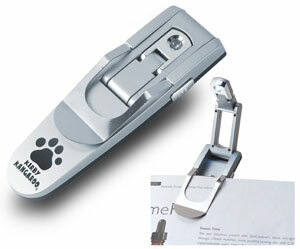 Size of robo reader book light: 4 1/2" x 1 1/2"
100 1 color(s) imprint at $315 ONLY $3.15 each. 150 1 color(s) imprint at $382 ONLY $2.55 each. 250 1 color(s) imprint at $514 ONLY $2.06 each. 500 1 color(s) imprint at $881 ONLY $1.76 each. 1000 1 color(s) imprint at $1,647 ONLY $1.65 each.